The alto saxophone, a member of the wind family of instruments, is used in a wide range of musical genres, such as jazz and rock 'n' roll. 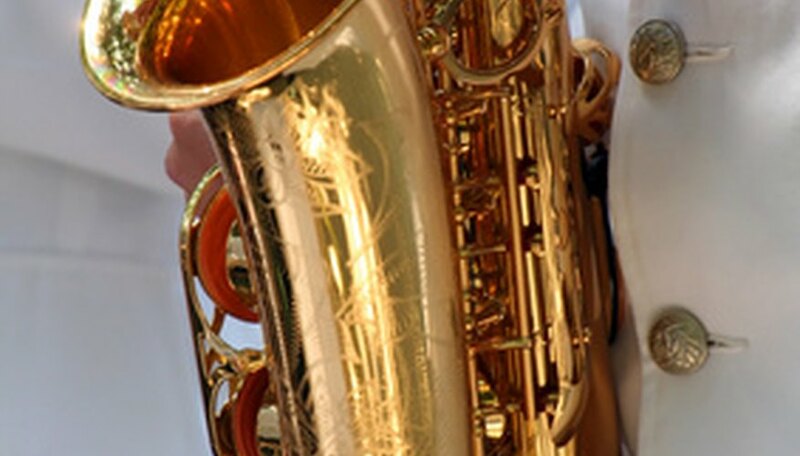 To become a skilled saxophone player, you need to learn to read music for your instrument. Music for the alto sax is written in the treble clef. The alto saxophone player must learn to read notes in the treble clef and transpose these notes as well because this instrument is in the key of Eb. Learn the names of the notes that are written on the lines of the treble clef. The lines from bottom to top are E, G, B, D and F.
Learn the notes that are written on the spaces. They are (from bottom to top) F, A, C and E.
Learn the notes underneath the staff. A note that is just under the first line is a D. A note below D that has its own ledger line is middle C. If you see a note beneath one ledger line, it's B. Learn the notes above the staff. The note that sits just above the top line is G. A is above G and has its own ledger line. The notes continue in musical alphabetical order (A, B, C, D, E, F and G), alternating between having a ledger line running through the note and lying between two ledger lines. Learn the basic rhythm notes. A whole note has no stem and is white in the middle. This note usually receives four counts. A half note usually receives two counts, has a stem and is white in the middle. A quarter note gets one count, has a stem and is completely black. An eighth note looks like a quarter note, except that it has a flag on its stem or is connected to one or more other notes via one horizontal line. Learn the basic rests. A whole rest is a small black rectangle that sits underneath the middle line and receives four counts. A half rest looks like an upside-down whole rest, in that it sits on top of the middle line; it receives two counts. A quarter rest is a black mark that looks similar to a "z" on top of a "c." An eighth rest looks like a small, slanted vertical black line with a tiny flag attached. Transpose all notes on the treble clef down three half-steps to play the correct note on the alto sax.The entire musical alphabet (including all half steps ) consists of A, A#/Bb, B, C, C#/Db, D, D#/Eb, E, F, F#/Gb, G, G#/Ab. For example, three half steps down from C would be A. A quick way to transpose as you read the music is to jump down one line or space. For instance, a note written on the top line (F) transposed down to the next line would be D, which is the correct note for an alto saxophone player to play when an F is written. This process of transposing is done in relation to concert pitch.